Disney is known for doing exceptional things, especially in their parks. Personally, I think the next step for Disney would be to do stuff with Virtual Reality. This made me wonder if Disney had done anything with VR because I hadn’t heard anything about it. After researching, I found that Disney has been trying out VR and the possibilities look endless. Disney Research has recently started messing around with VR. They have discovered this program called Cardinal. By using Cardinal, Disney Research has figured out a way to convert movie scripts into real-time VR experiences. The purpose of Project Cardinal is to speed up the process of making scripts into storyboards and eventually into animation. With Cardinal, it would all be automatic. Not only does the software take scripts and turn them into simple animations, but it also allows creators to put voice recordings in on the spot and preview the scenes in VR. Characters can be moved from within the headset and Disney Research hopes to add more advanced editing skills that creators can do within the headsets. If the creators can edit more things within the headset, it will make the process of making a movie go a lot quicker. 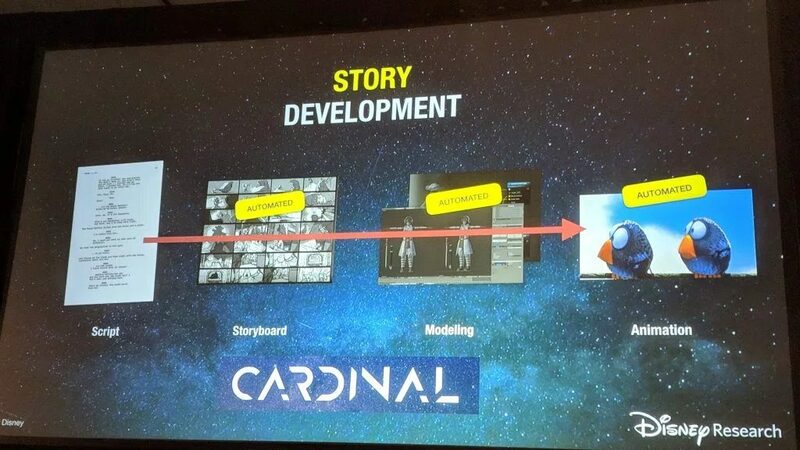 Disney Research is currently testing Cardinal with a number of filmmakers. Schriber admitted that there was still work to be done and Cardinal is not perfect. Schriber said, “Each scriptwriter writes in his or her own way.” This complicates the process since Cardinal only has a simple language for scripts that it takes in. Since all writers write differently, Cardinal will not work for all scripts. Disney Research has encouraged scriptwriters to make their writing simple. Disney Research also encouraged scriptwriters to stick to the present tense, since that is what Cardinal is used to. If scriptwriters are able to make their writing simpler, then their scripts will come to life a lot quicker. Instead of waiting almost two years, scriptwriter could be waiting only a handful of months to see their works come to life. Another cool thing that Disney has done is a drawing of a Disney character in VR. Disney animator Glen Keane went on The Late Late Show to draw his favorite Disney character, Ariel from The Little Mermaid, in VR. Keane used the app Tilt Brush VR app to complete this drawing. It is amazing to watch how Keane does this. Watch the video below and hopefully, you are just as amazed as I was! The way that the strokes are made in VR is mesmerizing and I found myself not being able to look away! I am hoping that Disney continues to explore the possibilities of VR. There are so many things that Disney could do with VR. Maybe one day, Disney will be able to do a VR Disney movie! Like I said before, the possibilities are endless.